For me, Tobago Underwater Carnival 2010 was fun, sea and adventure! As a non-diver and snorkeler, the experience was definitely thrilling. I arrived in Tobago on Friday evening, and checked in at the elegant and exotic Villas at StoneHaven; from there, I went up to Extra Divers Tobago where I registered for the dive festival with Dive Master Markus Baumgartner who operates in Crown Point. 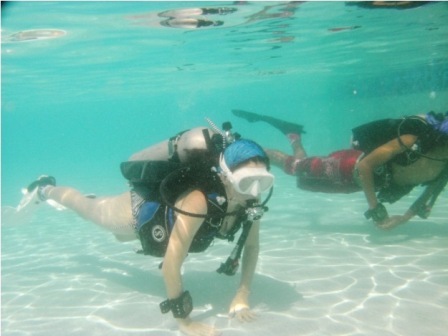 Local, regional and international divers and non-divers were in attendance at the Tobago Underwater Carnival. There were opening remarks from the Association of Tobago Dive Operators (ATDO) and Tobago Department of Tourism representatives. SCUBAPRO®, one of the sponsors, gave a presentation on their latest dive gear, and showcased their latest camera, the SeaLife® DC 1200 Underwater camera which I got the opportunity to test underwater. I was given a one-on-one demonstration of SeaLife® DC 1200 underwater camera by Fraser Purdon (Caribbean Territory Respresentative), which proved to be very easy and enjoyable to use. My networking skills with other attendees were effective, as I was able to meet various individuals who shared breath-taking underwater world stories that captured my interest more and more. The opening night was not quite over, with expression of the islands’ Trinbagonian steel pan sounds being played in the background, drinks and finger foods being served; I was then presented with a gift bag, filled with an array of resourceful and useful materials and gadgets. On Saturday and Sunday mornings the weather was clear, the sea was calm and I eagerly awaited some underwater adventure. Our boat captain, George of Extra Divers Tobago, was very friendly and had lots of dive stories, filled with adventure, mystery and suspense. Our first dive and snorkel site was Arnos Vale Bay. As I plunged into the warm water, I immediately encountered various corals, schools of fish and other aquatic life forms. I photographed lots of underwater sea life forms; some of which I was able to identify were the Lettuce Coral, Brain Coral, Fire Coral, Sea Fan, Feather Duster Worm, French Grunt, Yellowtail Parrotfish, Trumpetfish and Squirrelfish, because of the marine sea life chart in my gift bag. I was able to chat with some of the locals who were also on the snorkeling expedition, as they gave me a brief history of the Bay. 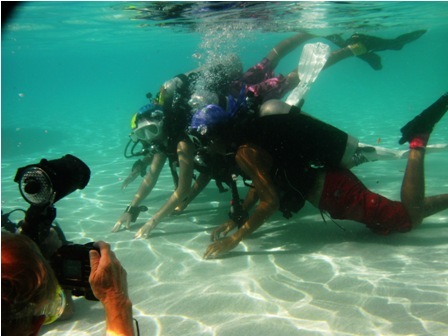 On Saturday evening of the Tobago Underwater Carnival, Linda and Lynn Laymon of Dive Training Magazine gave informative and practical demonstrations on underwater photography. Some key areas covered were teamwork between the model and photographer, trusting the photographer, respecting the model and good communication. I was enlightened and ready to put those attributes into practice. On Sunday evening, Michelle Cazabon-Mannette, a Turtle Conservation Officer for Turtle Village Trust featured “Biology and Conservation of Turtles”. Her presentation was very interactive, allowing us to participate in the discussion. I learnt a lot about sea turtles, especially how to identify them in Trinidad and Tobago; only five (5) species are found in local waters , all are endangered and there are only seven to eight species in the world! Of the two (2) most common sea turtles (Hawksbill and Green), I’m now able to distinguish between the two, all thanks to Mrs. Cazabon-Mannette’s interactive turtle identification session. For the remaining weekdays, there was continuous scuba diving and snorkeling throughout the southern side of the island, boat captain George of Extra Divers Tobago noted that Stingray Alley, Buccoo Channel and Mount Irvine Wall are great scuba diving sites. There was the Discover diving for school kids held at the Rex Beach Hotel swimming pool; families brought along their kids who also participated in the underwater fashion show in the swimming pool. The underwater fashion wear was provided by CoCo Cheznaynay® (she-nay-nay) Suuz Martines who added her array of watery chimera of beautiful colored ScubaDoRag™. The kids modeled their attire and they too had the opportunity to test SCUBAPRO® kids snorkeling gear during the try-dive sessions. I was given the opportunity to test my photography skills with Sealife® underwater cameras and apply Lynn and Linda Laymon’s practical demonstrations and Fraser Purdon’s one-on-one use of the SeaLife® DC 1200 underwater camera that they gave earlier in the week; I took several shots of the kids displaying their underwater fashion gear while other attendees joined in the fun. The turtle watching experience took place in the evening on Grafton Beach; before watching the turtles nest, the Save Our Sea Turtles (SOS) conservation group in Tobago core member volunteers and staff gave a talk on the organization’s mission, scale and scope of their activities and on-going research projects. We were also briefed on turtle-friendly tips and encounter guidelines. After the talk, we proceeded to the turtles’ nesting area on the beach, where a gigantic leatherback turtle was laying its eggs.At the time, it measured 97 cm in carapace length. I counted up to 77 eggs as it continued laying more. It was breathtaking to see such a huge sea animal on shore laying several eggs. The closing reception of the Tobago Underwater Carnival was held at The Pigeon Point Heritage Park with remarks from Tobago’s Secretary of Tourism and Planning, Assemblyman Oswald Williams, highlighting the success of Tobago’s first-ever Dive Fest. President of ATDO, Alvin Douglas, spoke and shared his experience of the Tobago dive fest. Ty Sawyer showed a magnificent presentation on his underwater photography photos. Everyone was fascinated by the marine life he captured. The evening closed off with a local steel drum pannist starting the partying with a variety of calypso and Caribbean music, with an all-inclusive open beach BBQ and bar drinks. As I networked, everyone shared how they all look forward to Tobago underwater Carnival 2011!! !